Focusing on a Division Title and Momentum · Let's Go Amerks! The Rochester Americans clinched a playoff position with a comeback win on Saturday night completing one of many goals set at the start of the season. The win required coming from behind and scoring four goals in the third period to win 6-4. 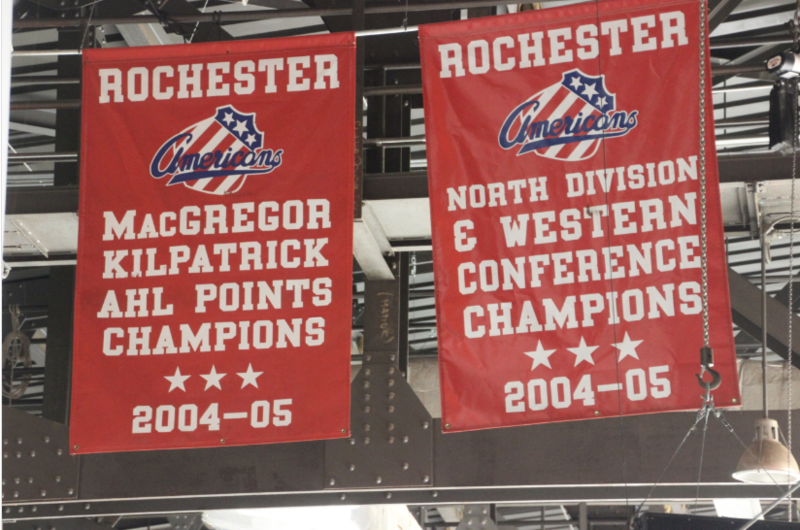 The last time the Rochester Americans won a division title was the 2004/2005 season when they finished in first place in the North Division, 14 points ahead of the St. John’s Maple Leafs. They also finished first overall in the league with 112 points (51 wins). That was also the NHL lockout year when the league was stacked. Thomas Vanek lead the Amerks that season in scoring with 68 points (42G+26A). Nathan Paetsch and Chris Taylor were also on that team. Along with Jason Pominville, Derek Roy, Paul Gaustad, Chris Thorburn, and many more. That season the team averaged 8,447* people in the building during the regular season (this is up for debate – free tickets were all over town often inflating numbers). As a comparison, the average this season is 5,113. The lowest it’s been since the Buffalo Sabres bought the Rochester Americans and reunited the affiliation. There’s six games remaining in the regular season, three of which are against Syracuse, the team they’re chasing. There’s also games against Belleville and Cleveland, two teams fighting for the last playoff spot in the division. The other team the Amerks play is Binghamton. They aren’t going to be easy games – everyone is playing for something. This could be the last full week of practice the team has and they’re using it as preparation leading up to the playoffs and making sure they’re all fine tuned. Syracuse currently has a one point lead in the North Division. Both teams have six games remaining. Three against each other. Syracuse plays Wednesday night which means the North Division race could lead into the final weekend or be decided by Saturday night. Zach Redmond remains out of practice and games with a lower body injury. The official status is day to day but if the playoffs were to start tonight he’d be ready to play. Taylor said that he’s closer everyday and they’re taking time with him. They want to make sure he’s back when he’s back. The night Redmond broke the Amerks record for goals by a defenseman in a season he took an awkward spill along the boards and missed the following 11 games with an ankle injury. Played 12 games and has missed the last six. The team needs it’s leading defenseman in the lineup but a healthier Redmond for the playoffs is better than a risking performance in the playoffs. Danny O’Regan didn’t play in the third period on Saturday night in Binghamton and missed practice Monday and Tuesday. Status is day to day. Andrew Oglevie has missed the last five games and it’s likely that his season is over with another upper body over. When he returned in mid February he was an instant asset to the team. Skating on a line with Remi Elie and Taylor Leier was a difference maker in games. Scoring wise and with physicality.